This is one of those “it ain’t pretty, but it tastes great” meals. Since it is oh so yummy and it can be made in a crock pot (aka, it is super-duper easy), it’s easy to look past the aesthetic. This is a perfect fall weather supper! Combine all of your ingredients in a crock pot (or on the stove top) and heat until everything is combined. Top with chives and serve immediately. We like adding Triscuits for a bit of a crunch. If you leave the tortellini in the crock pot while you're at work, it will absorb all the chicken stock; so if you like your tortellini firmer, add them to the pot 30-60 minutes before serving. 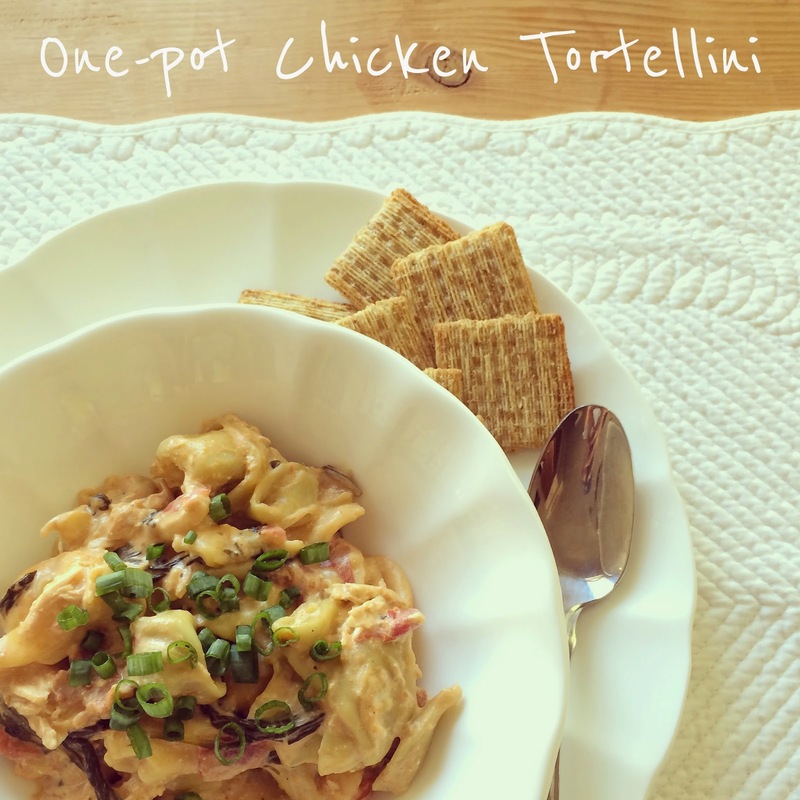 You had me at "one-pot" - you can't beat a simple yet delish meal! This sounds amazing- love adding the chicken to get a little protein- we will definitely be trying this out! Oh my gosh I'm drooling!! I can't believe that I can make this all in one pot!! This sounds SO good! And pretty picture, I find photographing food is the hardest - great job! That looks delicious!! I love crock pot meals, definitely adding this to my recipe list! That looks SO good!! Love crock pot meals. I'm definitely trying this one! This looks delicious!!! I love my crock pot, thanks for sharing! Um YUM. and the fact that it is easy gives it a bonus point! Sounds like perfection in my book! YUM! Adding this to the list of recipes I need to make! Mmmmm, this looks so good! I love that it's a slow cooker recipe too! This is my kind of weeknight meal! Looks sooo good! This looks soo good!! I might need to try this asap! 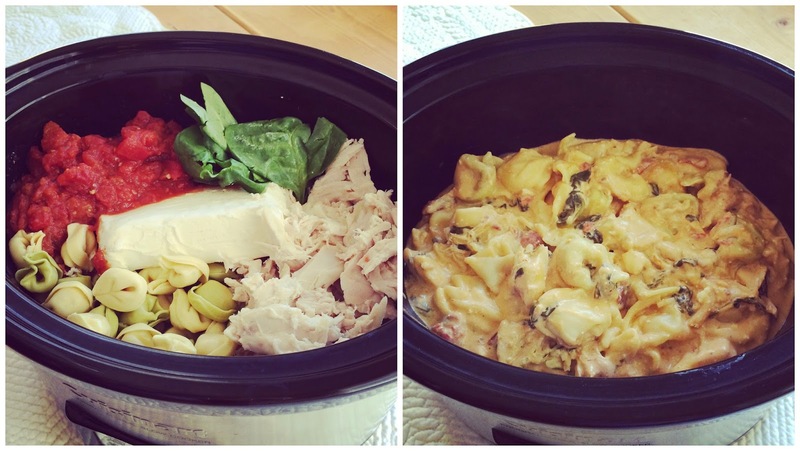 Crockpot meals are the best for weeknights! Love this! Absolutely will be making this one! Love how it's short on ingredients, too! I will definitely have to try this! Looks delicious! you had me a cream cheese. i love crock potting! :) is that a word?? Ohhh my goodness, Lisa. This looks incredible! I love that it only uses one pot, too. Easy cleanup! Thanks so much for sharing, it looks so delicious! YUUUM. I can't wait to make this! I bet it would work with ravioli too, which I have! Woah! That looks amazing! Anything with cream cheese and I'm in! Pinning it right now!